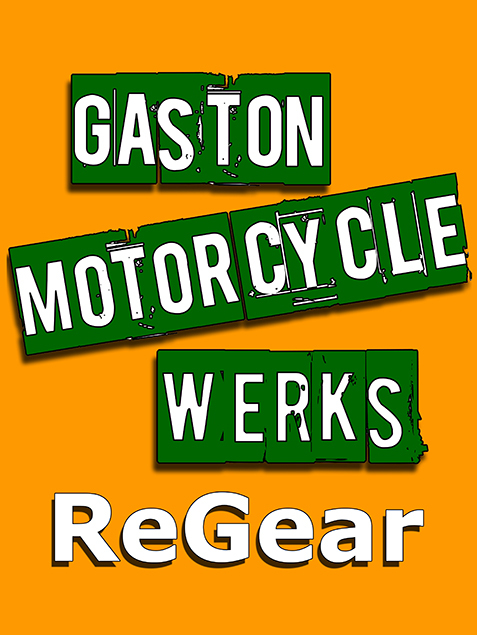 When most riders are asked to name several companies who make a replacement rear sprocket for their bike they come up with a short list. For many, this list doesnâ€™t include Sunstar. 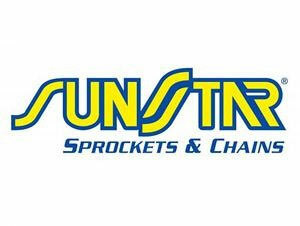 Funny how that works, Sunstar is the largest OEM sprocket provider in the world. And yet when we think about replacing our drive train theyâ€™re generally the last company we think ofâ€¦ If we think of them at all. 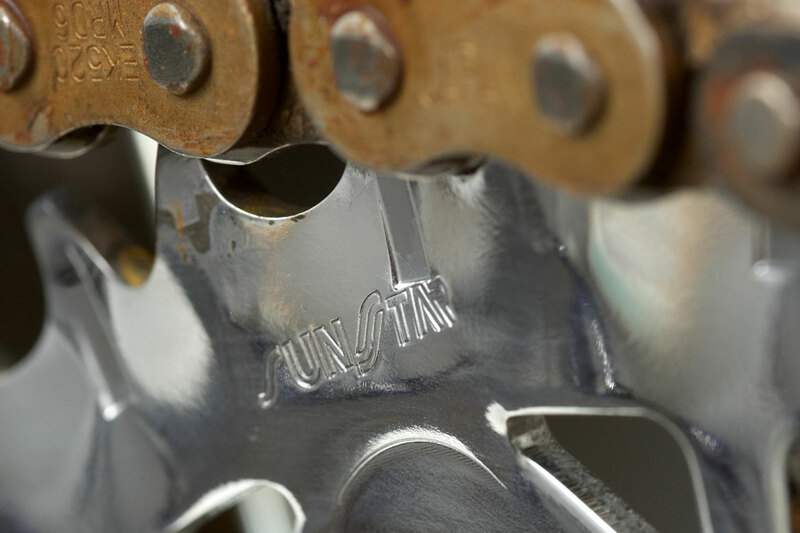 Well, Sunstar is hoping to change this with the evolution of the Sunstar Works Z sprocket, which is now made from the highest quality stainless steel. Works Z sprockets weigh up to 50% less than standard steel sprockets, can be up to 4 times more durable, and have 1.2 times the lateral strength of aluminum sprockets. According to Sunstar, they are the lightest steel sprocket on the market. And we believe them! The new Works Z sprocket is 100% heat treated and is lighter than before with the help of new weight reduction hole cut outs. But they still have a hardness 5 times that of an aluminum sprocket and twice the hardness of a standard steel sprocket. As a rule, a sprocket is a sprocket. It might be made from aluminum or steel or some other high tech material or combination of both but the spacing between the teeth has to be the same for the chain rollers to fit properly. The design variation between different companies is usually limited to material and cut out patterns. If you take a close look at your chain as it sits on your sprocket, you will see the width of the sprocket is just under the width of the inner link. Not so with the Works Z sprocket. Take a look at the photo below. You will see the Z sprocket is roughly half the thickness of a typical sprocket and the sprocket is twisted offsetting the teeth in such a way that the teeth alternate between each side of the sprocket. Imagine a stack of the letter â€œZâ€ piled on top of one another and youâ€™ll have the design of the Works Z sprocket. This creates the required width that keeps the chain centered on the sprocket. It really is quite clever and it allows Sunstar to utilize the far more durable metal of hardened steel and create a really lightweight, durable sprocket for just under a hundred bucks. It is not as light as an aluminum model but for most riders, the trade off is worth it. This design also affords great self cleaning capabilities due to its slender profile and offset tooth design. And we all know dirty chains wear really fast! We installed one on a 08 YZ250F, 09 CRF450R, and a 2010 KX450R GNCC race bike from Team R2W. The Honda and the Yamaha will be great long term tests for the sprocket and weâ€™ll have to get back to you with that info. The Team R2W GNCC race KX450F when ridden by our pro tester can go through a new chain and sprocket set in one event, depending on conditions. To this point, we have had the Sunstar Works Z sprocket on the Kawasaki for 3 full events and it is still looks brand new, proving to us just how good these Sunstar Works Z sprockets are.